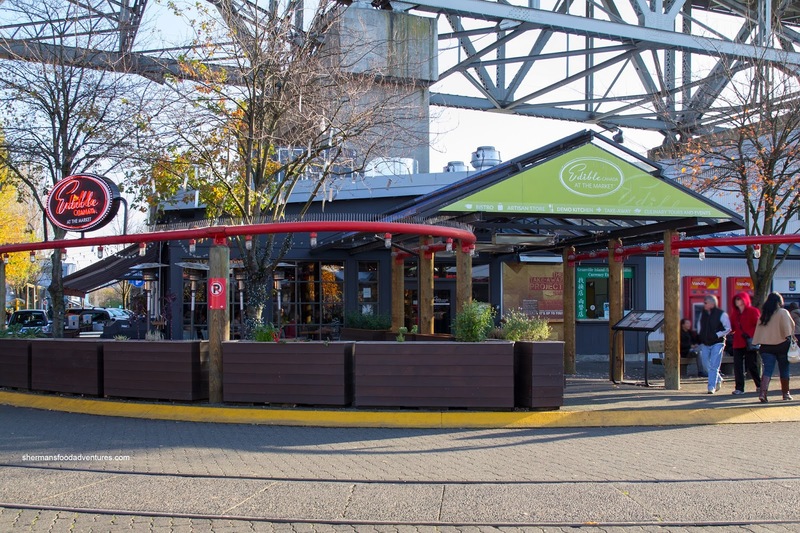 Often more than not, finding a kid-friendly restaurant where the adults can enjoy a unique (as in something that doesn't involve Triple-O sauce or an onion ring tower) meal is as challenging as a traffic circle in Vancouver (that upside down triangle means Y-I-E-L-D). 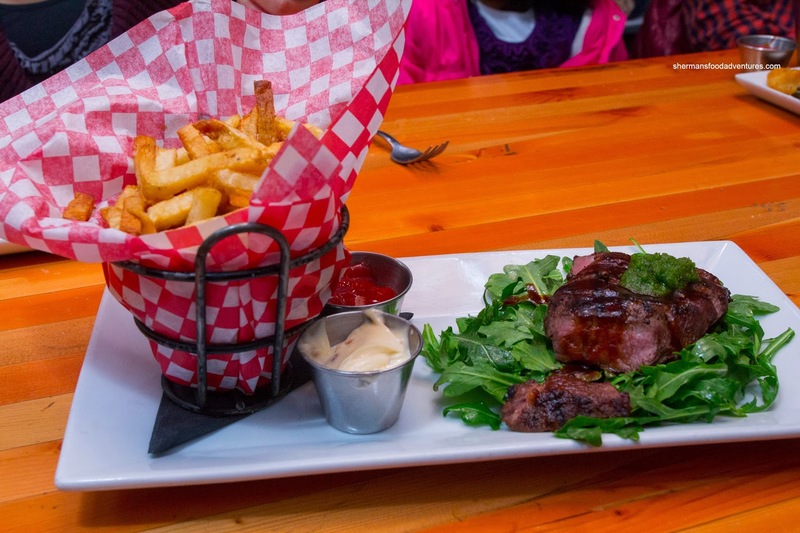 Sure, there are the hotel spots, but very few nicer restaurants offer an actual kid's menu. However, to our surprise, Edible Canada at the Market not only offers one, the prices are actually reasonable. Hence, Edible Canada was our destination for my dad's birthday. Exactly how it should be, the kid's meals arrived first. I commend them for that since many restaurants do not make such allocations for kids. 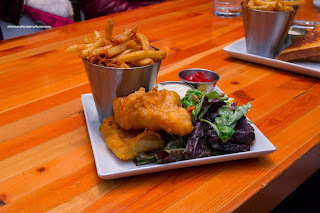 My daughter had the Fish & Chips with duck fat fries. For the price, this was not only an ample portion, it was good too. The fish was flaky and super moist while the batter was crunchy with minimal grease. As for the fries, they were crispy and aromatic from the duck fat. 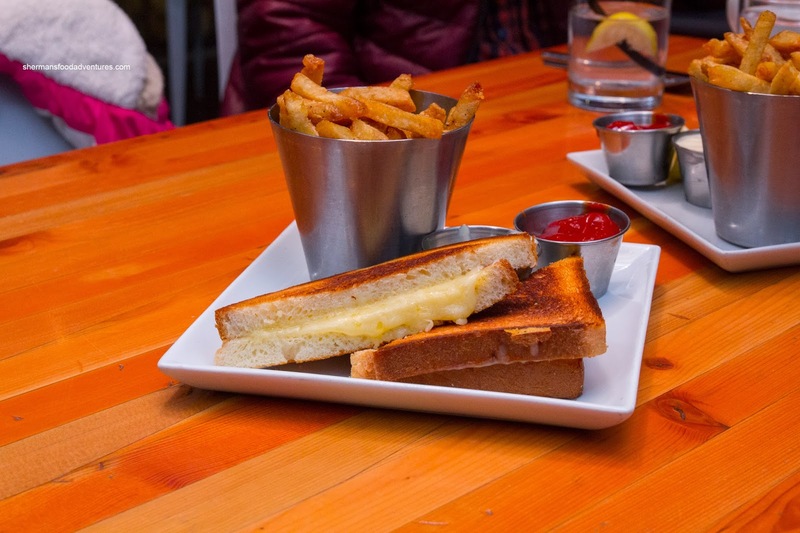 My son, the ever-adventurous eater (yah right), had the Grilled Cheese and fries. Made with white cheddar, it was a good grilled cheese being nicely browned on both sides. They weren't shy with the butter nor the cheese as it was quite rich. He exclaimed that he liked it, but he loved the fries even more so. 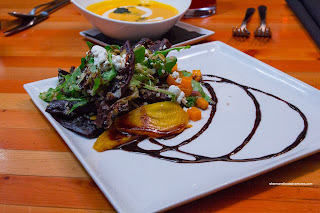 For myself, I had their 3-course menu starting with the Quinoa & Beet Salad. I found the field greens to be slightly overdressed, yet in the end, it wasn't devoid of flavour. With the quinoa mixed in, I found the texture to be quite odd while the beets seemed to be an afterthought on the plate. The crumble of goat cheese was a nice compliment though as it added a certain cool creaminess that was balanced by the balsamic reduction. For my next course, I had the Pacific Fish Cake with ginger and green onion accompanied by chili aioli. I found the breading to be decently crispy while the inside to be a bit too mushy for my tastes. It was like mashed potatoes. I did appreciate the considerable lemon hit as well as the tart and spicy aioli. 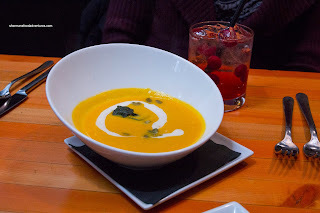 Viv also had the 3-course meal and started with the Spiced Butternut Squash Soup with Maple creme fraiche, sage and toasted pumpkin seeds. We found the soup to be smooth while mild in flavour. There was a hint of sweetness from the creme fraiche and herbiness from the sage. The star of the dish as the crunchy pumpkin seeds as they added some wonderful texture. Next, she had the Bison and Bacon Meatballs with curly kale, parsnip puree and tomato gravy topped with Allegretto cheese. 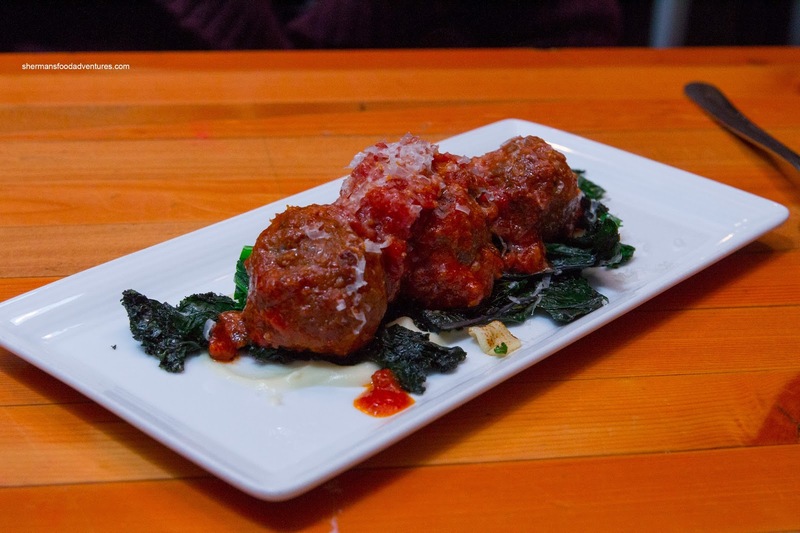 As expected, the meatballs were on the chewy and dry side due to the lean bison. It was meaty though where the fresh and tomatoey (while not tart) sauce was enough to flavour the dish. 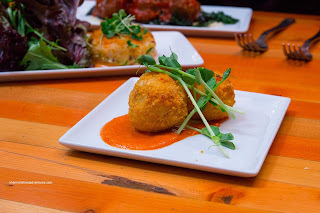 My dad also had the squash soup and followed it up with the Wild Mushroom Croquettes. These were made with goat cheese and served with a Romesco sauce. As evidenced in the picture, the croquettes were fried up light and crispy. Interestingly, we were searching for goat cheese and mushroom as the flavours were very muted. We liked the Romesco sauce though as it was mildly peppery with some nuttiness. 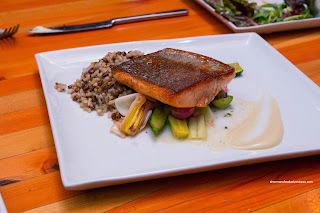 For his main, he had the Lois Lake Steelhead Filet with Canadian grain medley, harvest vegetables, herb beurre blanc and fennel puree. With a beautifully seared crispy skin and moist flesh, the salmon was prepared beautifully. It was only lightly seasoned where it was enough for flavour without overwhelming the fish. The veggies underneath were still crisp and vibrant. 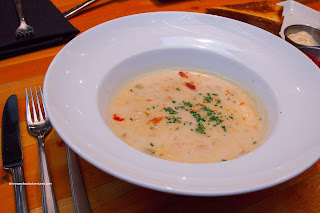 My mom went for the regular menu and began with the West Coast Clam Chowder. It was enhanced by double-smoked bacon and candied salmon which added a certain smoky-sweetness. Combined with a creamy and slightly seafoody broth, this was a solid interpretation of chowder. 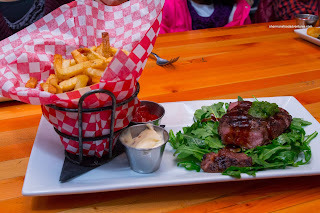 Onto her main, she opted for the Heritage Angus Steak Frites where the steak was sous-vide medium rare and served with peppercorn jus, salsa verde and duck fat fries. The steak was super moist and required little chewing. Both the jus and salsa verde were quite mild and did not interfere with the natural meat flavour. And as mentioned before, the duck fat fries were fantastic. 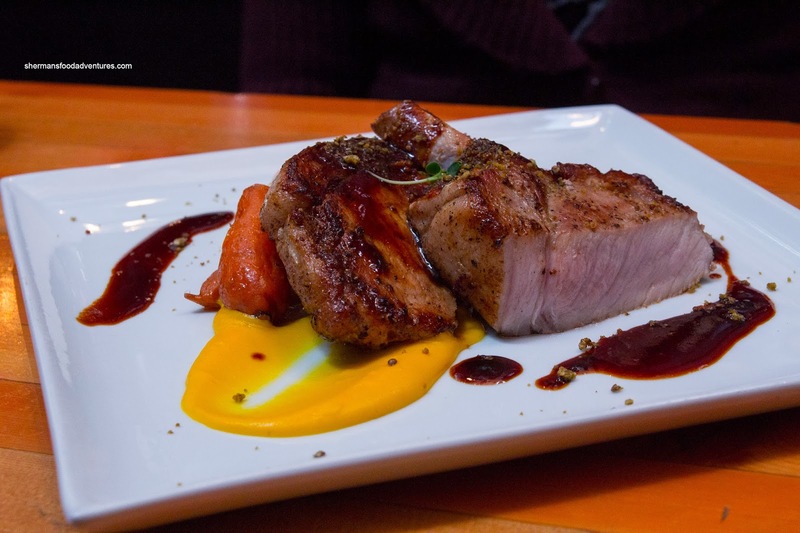 The award for dud of the meal, it would be Viv's Fraser Valley Pork Chop (served with buttercup squash puree, harvest vegetables, apple jus and mustard crumb). Although it was served slightly pink in the middle, Viv had to work her jaw muscles to break down the meat. It was in dire need of a brine (for flavour and texture) or something. We noticed a lady at the next table making a weird face when she took her first bite. Fail in every sense of the word. Onto my dish, I tried the Duo of Elk with medium-rare medallion, braised leg and spatzle, harvest vegetables and juniper jus. 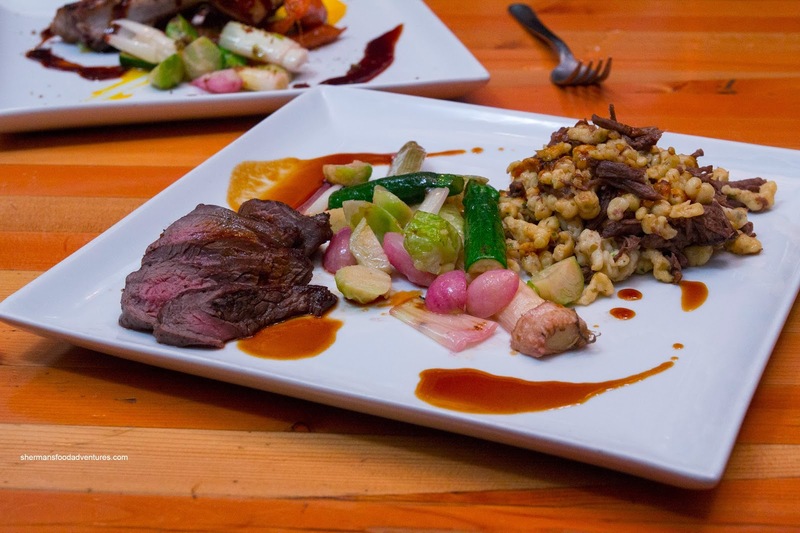 I loved the medallion as it had a flavourful bark and was remarkably tender for game while the jus added a nice red wine hint. I was not as enthused with the braised leg as it was pretty dry and stringy. Not sure if mixing it an equally dry spatzle was a good textural idea. 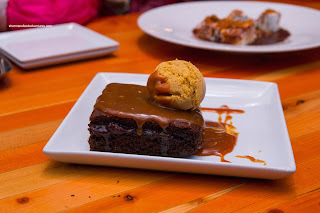 Lastly, we shared 2 desserts including the Molasses & Ginger Cake and Campfire S'mores. Resembling a sticky toffee cake, but with bits of candied ginger, the cake was not as sweet as it looked. We found it be moist with a considerable ginger hit. The salted caramel sauce was a nice compliment as it added even more moisture to the mild chocolate, molasses & ginger cake. Oh and the pumpkin ice cream made it even more rich! 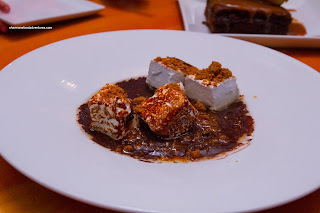 With their interpretation of s'mores with a bed of melted dark chocolate, torched marshmallows and graham cracker crumble on top, they were able to elevate it to another level. We liked it for its simplicity. In conclusion, the meal as a whole was acceptable except for a few duds. 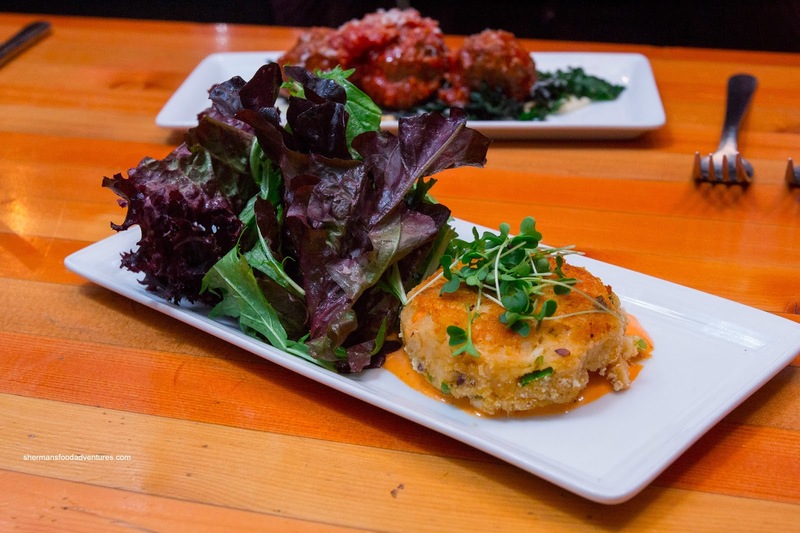 Considering the wide range of dishes we sampled, it is impossible for any restaurant to be perfect. 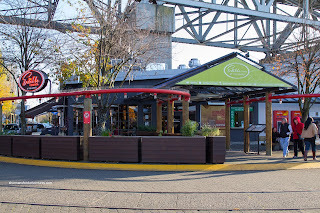 Therefore, if you choose the right dishes, Edible Canada is an option on Granville Island.